This is a nice little Sunday project. I recently acquired a super cheap pasta machine, so i set out to see how hard this was. My interest in fresh pasta began at Posada Margherita in Tulum. I thought it was so bizarre that some of the best pasta Ive ever had was in… Mexico?? (and yes I’ve traveled through most of Italy) Good food is good food. 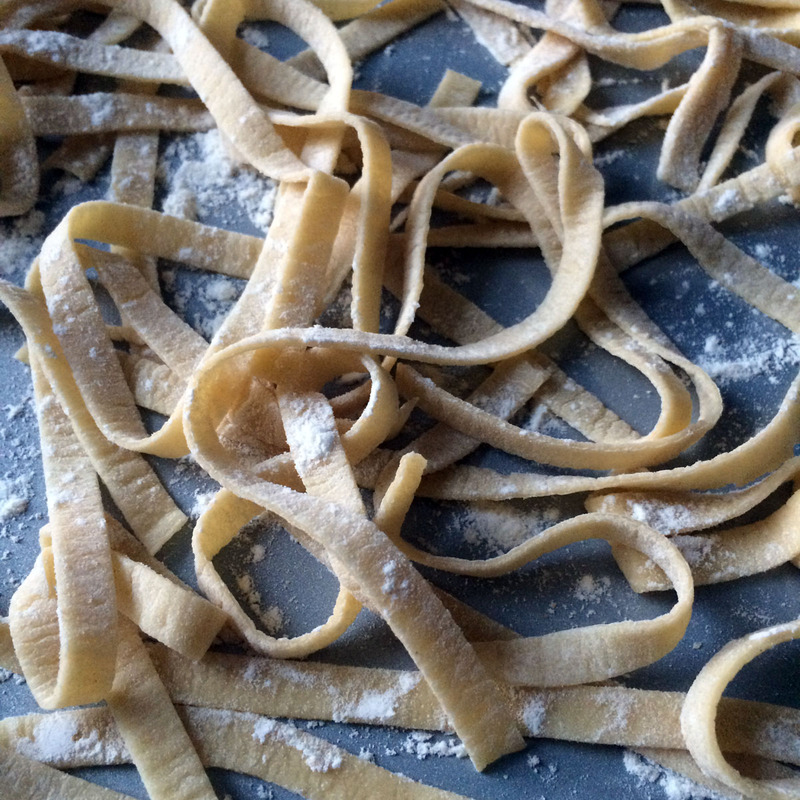 The Kitchn has a great fresh pasta tutorial. Most of this recipe is adapted from them with adjustments for a food processor vs. hand kneading. Combine flour and salt in the bowl of a food processor fitted with blade attachment. Pulse a few times to combine. Crack the eggs on top of the flour. Process for 30-60 seconds, until dough comes together and forms a ball.If sticky add flour, if its too dry and pebble like, add more water. Repeat until dough comes together. Remove dough from food processor, shape into a ball. Rest dough in bowl covered with plastic wrap for at least 30 minutes. Divide the dough into four equal portions. Dust the portions with flour and cover with a clean dishtowel. Make sure to keep all pasta dusted with flour. You do not want the dough to stick to anything. Flour all surfaces including your hands when handling the dough. Set your pasta machine to the thickest setting (usually marked “1”). Flatten one piece of dough into a thick disk between your hands and feed it through the pasta roller. Repeat once or twice. Fold this piece of dough into thirds, like folding a letter, and press it between your hands again. With the pasta machine still on the widest setting, feed the pasta crosswise between the rollers. Feed it through once or twice more until smooth. If desired, repeat this folding step. This helps to strengthen the gluten in the flour, giving it a chewier texture when cooked. Begin changing the settings on your roller to roll the pasta thinner and thinner. Roll the pasta two or three times at each setting, and don’t skip settings (the pasta tends to snag and warp if you do). If the pasta gets too long to be manageable, lay it on a cutting board and slice it in half. Roll the pasta as thin as you like to go. Ive tried both thicker and thinner, and i prefer the pasta as thin as possible since it tends to puff slightly when cooked. Cut the long stretch of dough into noodle-length sheets, usually about 12-inches. If making filled pasta or lasagna, proceed with shaping. If cutting into noodles, switch from the pasta roller to the noodle cutter, and run the sheet of pasta through the cutter. Toss the noodles with a little flour to keep them from sticking and gather them into a loose basket. Set this basket on the floured baking sheet and cover with a towel while you finish rolling and cutting the rest of the dough. To cook the pasta immediately, bring a large pot of water to a boil, salt the water, and cook the pasta until al dente, 4-5 minutes. To dry, lay the pasta over a clothes drying rack, coat hangers, or the back of a chair, and let air dry until completely brittle. Store in an airtight container for several weeks. To freeze, either freeze flat in long noodles or in the basket-shape on a baking sheet until completely frozen. Gather into an airtight container and freeze for up to three months. Dried and frozen noodles may need an extra minute or two to cook.